This is the second of Boismortier's Six Concerti for Five Flutes or Other Instruments, Op. 15. The Concerto in A minor has the distinct charm of the French Baroque style, especially felt in the beautiful, pastoral slow movement. However, the influence of Vivaldi is also evident in the first Allegro, and of Corelli in the last. Although the title suggests that the Concerto can be played on other instruments, in the case of a “cello consort” it certainly could not be done without some modifications. The 4th and 5th flutes play in unison almost throughout the piece and such a doubling, while necessary to reinforce the weaker lowest register of the flute, would upset the balance with cellos. Consequently, the quintet was turned into a quartet. 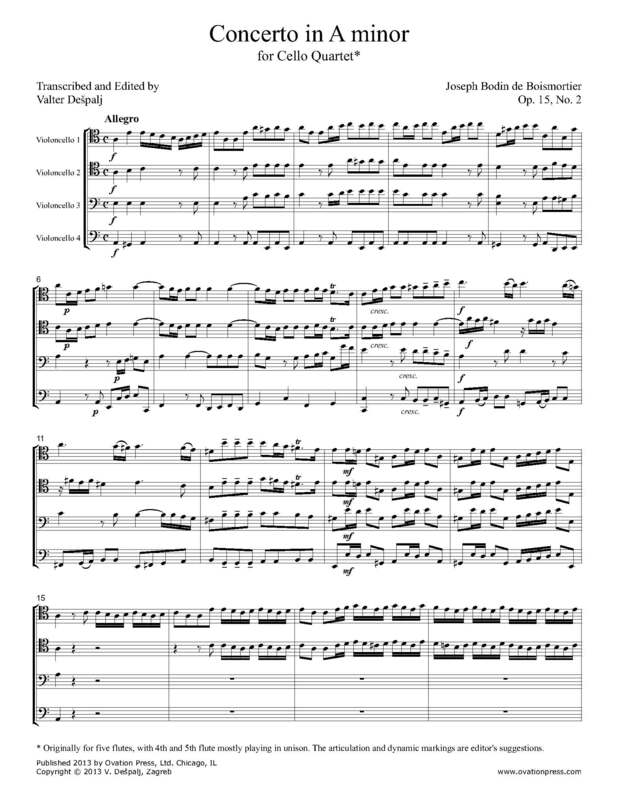 Furthermore, the texture of the original version is very dense, which is again suitable for the flutes. For cello quartet, however, some spreading of voices had to be done in order to achieve lightness and transparency of sound. This edition contains slurs and dynamic markings (in the urtext there are none), but experienced baroque cellists will, no doubt, explore various possibilities. The most important thing is not to indulge into excessive dynamic changes but rather to allow the logic and good humor of this music to speak for itself.